In May 2016, a fire in Fort McMurray, Alberta burned over 85,000 hectares and displaced the entire city. After the Fire, written by Matthew MacKenzie, and presented by Punctuate! Theatre, Alberta Aboriginal Performing Arts and Native Earth Performing Arts at The Theatre Centre, examines the aftermath of this disaster. Through the lens of one extended family, we see the economic, environmental, and, most importantly, the human costs of one of the largest natural disasters in Canadian history. Carmell coaches the local girls’ hockey team. She has taken in her sister, Laura, and Laura’s husband Barry who have lost their house in the fire. Carmell is separated from Ty, an oil sands worker who has lost his job, and is now living in his RV. We know something is wrong from the start, but we have no idea what. It is night and Barry and Ty are in the woods digging a hole. Laura and Carmell are running through the night somewhere nearby. They need to get rid of Laura’s purse without being seen and get back in time to meet the men at Boston Pizza for Fishbowl Friday. It sounds like the set up for either horror movie or a screwball comedy yet After the Fire is neither. Although there are some funny moments, the play crackles with tension. I found it quite dark, but human not horrifying. All four characters are breaking under the stress of the fire. The play alternates between scenes with the two men and those with the two women and features excellent performances. Barry (Sheldon Elter) doesn’t say much for the first few scenes. He is facing an existential crisis about the natural destruction caused by the oil and mineral industry on which his livelihood depends. Ty (Jesse Gervais) is a frenetic talker who is racked by guilt and somehow utterly clueless how he has ended up with a broken marriage. Carmell (Louise Lambert) is tightly-wound and hard as nails. Laura (Kaitlyn Riordan) is flakier but endearing. Each finds the other infuriating but they rely on each other to hold their lives together. I really liked how the production made use of the space. The play is performed in the round. There is huge pile of dirt and mulch in the center where Barry and Ty actually dig a hole. Carmell and Laura move around the outside of the space and sometimes crisscross the middle as they make their way through the night. It felt immersive. Sometimes the actors were right next to me, so close I could hear their breathing and see their sweat. I also loved the use of sound throughout the play. Sound designer Dean Musani creates a sound scape that subtly conveys location and atmosphere with just a few seconds of geese calling or the cheers at a hockey game. The increasingly frenetic pace of the play leads to a twist and “big reveal” at the end, which, for me, didn’t ring true. It seemed unbelievable, almost absurd. But maybe that’s the point. Trying to go back to normal life after your world has been destroyed is absurd. After the Fire shows us four people doing the best they can to make sense of a life where absolutely nothing is the same as before. It was unsettling but ultimately moving, human and strangely relatable. 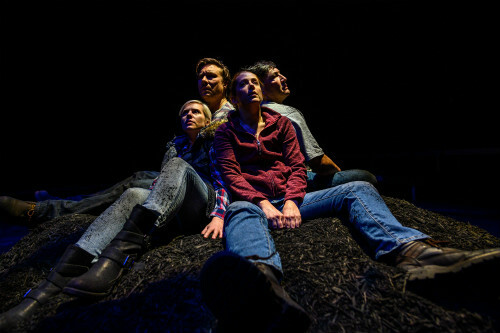 After the Fire is playing at The Theatre Centre (1115 Queen Street West) until January 19, 2019. Tickets are $25 for adults/ $17 for seniors, students, and arts workers and can be purchased online, in person at the box office, or by calling 416-538-0988.